Routledge, London and New York, 2017. 110pp., £21.99 pb., $39.95 pb. Robin Hahnel tries to show that Sraffian theory is superior to Marx’s theories of value, price, and profit. He claims that the former, unlike the latter, is ‘modern, rigorous, [and] logically sound,’ while being equally critical of ‘capitalist inequality’ (1). Marx’s theories are logically inconsistent, according to Hahnel, because he lacked the mathematical tools needed to understand that prices and profits are determined by physical quantities, not by the production of value and surplus value. 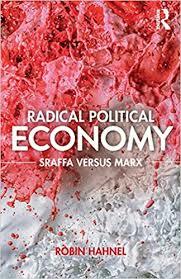 Although he says that his book is ‘dedicated to providing’ a coherent radical alternative to ‘formal Marxian economy theory that has been lacking ‘for too long’ (1), the story Hahnel tells about Sraffa’s physical quantities, rescuing us from Marx’s supposedly inconsistent value analysis, is actually very old. Ian Steedman’s Marx after Sraffa made it famous forty years ago. However, a few things in this book aren’t part of standard Sraffianism: first, it contains a moral critique of profit income. Second, Hahnel points out that economic growth and environmental stability are compatible as long as material ‘throughput efficiency’ increases faster than labor productivity. Although he couches this discussion in terms of eigenvalues of physical coefficients, they are not needed to make the point, and their use here has nothing to do with Sraffian price theory. Third, he counters the observation that ‘Sraffian economics … has no counterpart to Marxian theories of crisis’ by briefly surveying post-Keynesian and similar macroeconomic theories and rechristening them as ‘Sraffian Crisis Theory,’ since they are supposedly ‘intellectually allied and linked with’ Sraffianism (40-41). Finally, Hahnel looks at the conditions under which capitalists will adopt new technologies. He alleges that ‘it has fallen to Sraffians to emphasize’ that capitalists will reject productivity-enhancing technologies that increase their costs per unit of output (46), ignoring the fact that Marx emphasized this long ago: ‘the new machine has definitely raised the productivity of labour. But as far as the capitalist is concerned … the commodity has not become cheaper and the new machine is not an improvement. The capitalist, therefore, has no interest in introducing the new machine’ (Capital, vol. 3, chap. 15, sect. 4). More than a third of the book is about profit, why it exists and whether its existence is just. Hahnel claims that ‘in the Marxian formulation, workers are ‘wronged’ because they don’t get the full value of what they produce’ (97). However, he contends that Marx shied away from saying this explicitly, due to his Hegelianism, and his desire to criticize capitalism on ‘scientific’ rather than ‘moral’ grounds (78). Hahnel thus seems to think that he is following in Marx’s footsteps, but improving on him, by providing a ‘straightforward moral’ (79) condemnation of profit. There is, however, a more prosaic reason for Marx’s ‘shyness.’ He did not regard income distribution under capitalism as unjust. Hahnel claims that employers ‘expropriate’ (3, 30) some of the ‘surplus goods’ that workers produce. Yet, one cannot expropriate someone’s property if it was not their property in the first place, and goods produced by workers under capitalism were never their property. Nor are they underpaid for the output they produce, because they are not paid for their output, but for showing up at work. This is why Marx denied that ‘the [worker] has been defrauded’, and affirmed that the portion of the product that represents surplus-value is ‘the legitimate property of the capitalist’ (Capital, vol. 1, chap. 24, sect. 1). He returned to this theme some years later, opposing the Gotha Programme and the political party founded on its basis, largely because they advocated ‘fair distribution.’ In his Critique of the Gotha Programme, he contended that present-day income distribution is the only ‘fair’ distribution, given of the present-day mode of production. He was not shying away from moral criticism of capitalism, but rejecting the inconsistency and futility of calls to alter only its distribution relations, while leaving untouched its production relations that produce ‘unfair’ income distribution. Conversely, Hahnel rages against the capitalist ‘parasites’ (31, 83, 97) and ‘capitalist inequality’ (1), while saying precious little about the system’s production relations. Citing another book of his for the proof, Hahnel puts forward the ‘Fundamental Sraffian Theorem.’ The alleged theorem is: ‘If and only if there is a physical surplus of goods after wages have been paid will profits be positive. In other words, if and only if those who produce goods are deprived of some of the surplus goods they produce can capitalists have positive profits’ (25). This is simply untrue. The ‘theorem’ purports to be completely general. It must therefore hold true without any exceptions. In fact, however, the exceptions are the rule. Hahnel’s conclusion does not hold true in any of the following, quite common, cases: (1) rates of profit are not exactly equal in every industry; (2) some inputs to production (means of production) aren’t reproduced as outputs; (3) some inputs are used to produce outputs of the same kind (e.g., horses used to breed horses), but are not inputs into the production of all other goods, either directly or indirectly; (4) the output of some goods only doubles when the amounts of inputs used to produce them more than double; and (5) the price of an input differs from the price of a unit of the same good when it later appears as an output. In an economy with any of these features, there can be positive profits even though the economy is incapable of producing a physical surplus and/or negative profits despite the fact that there is a physical surplus after payment of wages. Direct disproof of Hahnel’s conclusion is unnecessary. The physicalist mathematics underlying his ‘Fundamental Sraffian Theorem’ is, as he acknowledges (29, 82), the same as that of Michio Morishima’s so-called ‘Fundamental Marxian Theorem,’ which is already known not to hold in the quite common cases noted above. Hahnel has proven nothing about why profit exists in the economies in which we actually live. Lest I be accused of denying the utility of theoretical models that contain unrealistic assumptions, I note that we are dealing here with theorems, not theories. A case can be made for deducing hypotheses and predictions about the real world from models that contain assumptions at variance with real-world conditions. But Hahnel is not hypothesizing or predicting. He claims to have deduced a theorem – a conclusion guaranteed to be true by logic alone. No case whatsoever can be made that deductive logic alone guarantees that truths about imaginary situations are also truths about real-world ones. In addition, the mathematics of his ‘Fundamental Sraffian Theorem’ provides no warrant for Hanhel’s attempt to explain the existence of profit exclusively in terms of ‘those who produce goods [being] deprived of some of the surplus goods they produce’. He stresses, correctly, that Morishima’s ‘Fundamental Marxian Theorem’ arbitrarily identifies one input to production, labor, as holding ‘the key to the origin of profit, when in fact every input could be used to tell the same story’ (83). But he commits the exact same error in the very next sentence, when discussing his ‘Fundamental Sraffian Theorem’: it ‘identifies the actual goods and services workers produce which capitalists manage to appropriate’ (83, emphasis added). As long as we confine ourselves to physical production rather than the production of value – a concept that Hahnel eschews – this privileging of workers’ contribution is unjustified. In the real world, and in his model, all physical inputs jointly contribute to output, so ‘every input could be used to tell the same story’: there is positive profit if and only if the sellers of machines, electricity, paper clips, and so forth are deprived of some of the surplus goods their inputs produce. Indeed, as V. K. Dmitriev, the foremost predecessor of Sraffianism, pointed out more than a century ago that the physicalist framework that he and Hahnel share implies that there would be positive profit in a fully automated economy that yields a physical surplus, even though the workers it does not employ are not ‘deprived’ of the surplus goods they did not produce. This is the simplest and clearest refutation of the second sentence of Hahnel’s ‘theorem’. However, he does seem to sense the inconsistency into which he has fallen. He writes that ‘it is the economy that is productive’, i.e. the ‘entire economy’, not just workers (25). But he then attempts to identify labor as the key to the existence of profit by arguing that, ‘while it is the economy as a whole that is potentially productive, … real people … turn this potential into an actual surplus of useful goods and services’ (25-6). This distinction between potential and actual is of no help, since, again, the physical surplus of goods results from the (actual) joint contribution of all physical inputs. Hahnel then tries a different defense of his privileging of workers’ contribution, launching into an extended discussion of technical know-how in an effort to reduce non-labor inputs’ contribution to production to the contribution made by past intellectual labor. It is hard to see how this helps to support his claim that profit exists because currently-employed workers are ‘deprived’ of some of the physical surplus they produce. It suggests, instead, that our deceased ancestors are the ones not receiving all of the surplus goods their labor has produced. Hahnel tries to justify his claims that Marx’s value theory is internally inconsistent, and that his law of the tendential fall in the rate of profit is false, in a way that is woefully inadequate, especially for a self-proclaimed champion of rigor and logical soundness. Although he acknowledges elsewhere that ‘debates often rage over how to interpret Marx on any subject’ (57), his procedure is to put forward an interpretation of Marx’s arguments, without acknowledging that it is an interpretation rather than Gospel truth, and then cite authorities who supposedly proved that Marx was inconsistent or wrong. But these authorities actually proved only that this particular interpretation, not Marx’s texts as such, leads to inconsistency and error. Whose fault is this, Marx’s or the interpreters’? If all existing interpretations led to inconsistency and error, it would be reasonable to conclude that Marx himself was at fault. But there are interpretations of the texts in question on which Marx’s arguments are logically valid. The reasonable conclusion is thus that the interpretations that lead to inconsistency and error are to blame, since, according to the principle of charity and similar dicta, interpretations that fail to make an argument make sense are probably wrong and should therefore be rejected in favor of interpretations that succeed. For example, Hahnel claims that Nobuo Okishio ‘proved’ that Marx’s law of the tendential fall in the rate of profit was a ‘red herring’; labor-saving technological change will never cause the rate of profit to fall (42). Yet, eleven pages later, he lets the cat out of the bag. In Okishio’s model, the price paid for an input at one time always equals the price of the same good when it is later produced as an output. However, if ‘steel capitalists pay a higher price per ton when they buy steel as an input than they receive when they sell steel as an output, steel capitalists will obviously have a lower rate of profit than if they bought and sold steel at the same price’ at two different times (53). Thus, if labor-saving technological change tends to reduce output prices relative to input prices, the actual rate of profit can fall even as Okishio’s rate of profit rises. And thus, if Marx’s law is a law about the actual rate of profit, not Okishio’s rate, its logic emerges unscathed. Everything here turns on the question of whether Marx himself constrained output prices to equal input prices. But Hahnel will not go there. He writes that ‘We will not speculate here about’ the answer to that question (52) , after pages upon pages in which an affirmative answer is assumed to be Gospel truth. ‘Instead, we will ask which assumption is more appropriate for purposes of analysis’ (53). Since the purpose of his analysis at this point is (or should be) to judge whether Marx’s law is logically valid, the answer is obvious. The input-price-equals-output-price assumption is not appropriate unless we find, through rigorous interpretive analysis, that Marx himself made that assumption, implicitly or explicitly. Yet, what Hahnel means by ‘appropriate for purposes of analysis’ has nothing to do with getting Marx right. He means ‘appropriate for doing good economics.’ In other words, after claiming that Okishio’s theorem proved that Marx’s law was a red herring, and then conceding, however grudgingly, that the ‘proof’ rests on a disputed point of interpretation, he changes the subject. He writes that ‘the “law of uniform price” … has been a staple of every school of economics’ (53), which is true but irrelevant, since this law says that prices of different units of the same good that are bought and sold ‘very close to the same time’ (64 n8) will be equal. It says nothing about the price of bricks that were inputs into a brick-making factory built 30 years ago being equal to the price of the bricks that emerge from that factory as outputs today. Even Sraffians such as Christian Lager (1998) acknowledge that the prices of investment goods purchased last period must be allowed to differ from the prices of units of the same good produced this period when one computes a rate of profit. Hahnel also writes that there is ‘no reason to believe’ that labor-saving technological change tends to reduce output prices relative to input prices (53). This is simply untrue. Standard aggregate supply and demand analysis predicts exactly this, and the ‘equation of exchange’ likewise implies that faster productivity growth will reduce the inflation rate if monetary circulation per worker grows at a constant rate. Empirical studies (e.g., Mincer and Danninger 2000) have found that technological advance significantly reduces inflation, and this relation is a staple of Federal Reserve thinking. Alan Greenspan (2000) – hardly an ‘obdurate Marxist’ (51) – explained the relation as follows: ‘faster productivity growth keeps a lid on unit costs and prices. Firms hesitate to raise prices for fear that their competitors will be able, with lower costs from new investments, to wrest market share from them’. In a final attempt to put the cat back in the bag, Hahnel claims that, even if technological change does tend to reduce the inflation rate, ‘there is no reason to believe [that this] would lower the rate of profit’ (54), because the new, lower prices are not only the prices at which outputs are sold; they are also the prices at which new inputs are bought. Indeed they are, but this is likewise irrelevant. The rate of profit to which Marx’s theory refers is the ratio of profit received today, at today’s lower prices, to the capital invested in the past. The capital invested 30 years ago to construct a brick-making factory was based on the price of bricks then, not the price of replacement bricks today. Interesting review, the name of the reviewer seems to have been accidentally omitted. Can it be included please? Thanks for pointing this out, error corrected.